EDINBURG — As 18-year-old Pharr native Brandon Morales was preparing to make his first appearance for the RGV FC Toros, a group of MLS veterans approached him in the locker room. Suiting up for the Toros on Saturday were Houston Dynamo players Eric Bird, Conor Donovan, Chris Seitz and A.J. DeLaGarza — a captain for the Dynamo last season who has more than 200 MLS matches under his belt. 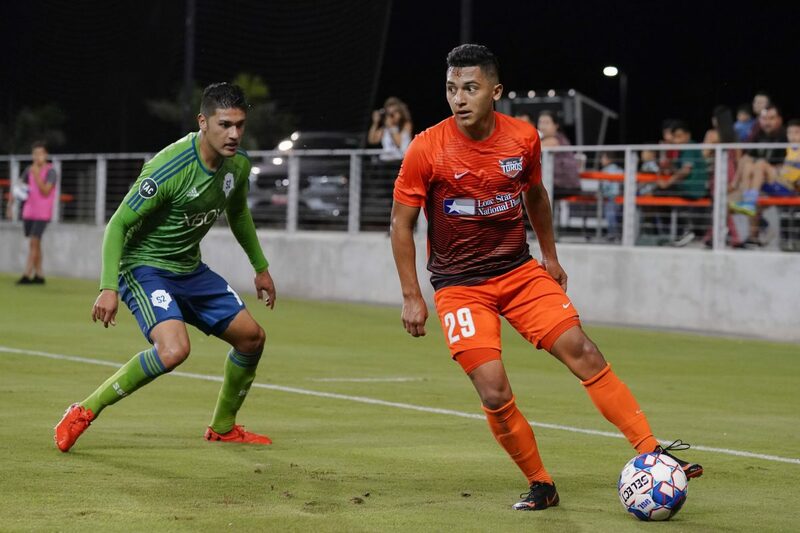 The first player in Toros Academy history to sign a first-team contract, Morales played 67 minutes in his debut on Saturday as RGV earned a 3-0 win against Seattle Sounders 2 at H-E-B Park. Morales said he first began to think he would be in the starting 11 during Wednesday’s training. By Friday, it was all but official. Toros coach Gerson Echeverry said Morales was “a lot more composed than a normal 18-year-old,” praising his ability to fit into a central midfield role rather than his more natural position out wide. Morales said he rated his performance “a seven or an eight,” adding that he wished he could have registered a shot or a quality through ball. He finished with 35 touches, 23 passes, two tackles, a chance created and a foul won. Morales said he spread word of his starting opportunity to his family and closest friend. By Saturday’s game, he said about 40 friends and family members were in the stands to support him. He met many of them in the northwest corner of the field after the match, shaking hands and posing for photos. The Toros earned their most decisive victory of the season Saturday, winning by a margin of three goals or more for the first time. The victory improves the Toros to 6-11-13 on the season, already eliminated from playoff contention with four matches remaining. At home, RGV is now 5-3-8. Seattle, the last-place team in the Western Conference, falls to 5-19-5 and 0-12-2 on the road. RGV controlled the match from start to finish, building a 12-5 advantage in total shots and a 6-3 edge in shots on target. Seattle held 61.6 percent of possession, but rarely in threatening parts of the field. Todd Wharton opened the scoring for the Toros in the 5th minute. He received a pass from Carlos Small about 35 yards from goal and had plenty of time and space to send a sinking shot into the left side of the net. The strike pulled Wharton into a tie with Aldo Quintanilla and Jesus Enriquez for the team lead in goals with five. Eric Bird, Wharton’s old college teammate at the University of Virginia, extended the margin to 2-0 in the 41st minute. After a throw-in, Bird received the ball in the left side of the penalty box and used his right foot to pop the ball over his head. He turned his back toward the net, then used another right-footed touch to flick the ball over his head again in the opposite direction, allowing him to spin and face the target. He chested the ball down and fired a sharp-angle shot just inside the far post. Bird, a Houston Dynamo assignment player, was making just his fourth appearance for the Toros this season. Last year, Bird was a fixture in the RGV lineup. He led the team with 33 chances created while ranking second in minutes played and picking up four goals and three assists. Saturday’s goals for Wharton and Bird were scored past Sounders keeper Calle Brown, who teamed with them at Virginia and as a member of the Dynamo organization last year. Brown made 12 starts for the Toros in 2017. Nicolas Perea iced the game for the Toros in the 78th minute, converting a header off a corner kick for a 3-0 advantage.